St Neots winners, left to right: Huw Jarman, Tim Neill, Jaione Echeveste, Helen Knowles and Ali Brown. 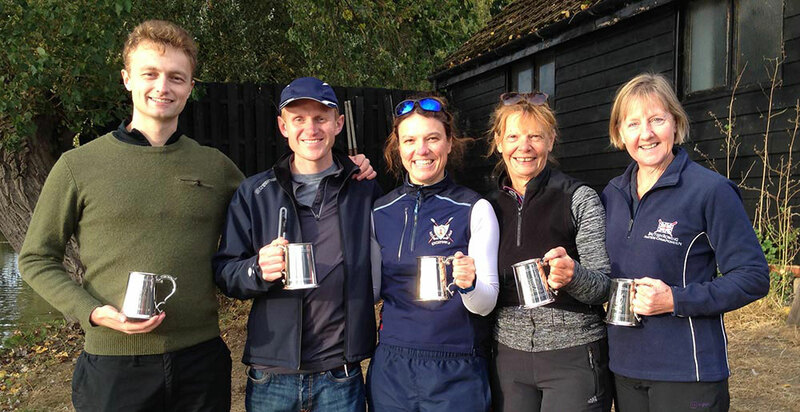 St Neots Rowing Club was celebrating four fantastic wins at the end of its annual head race this year. Huw Jarman secured top spot in the open band one single sculls category with an impressive time of 10 mins 24 secs, enough also for Huw to be the fastest male single sculler on the day. Tim Neill and Jaione Echeveste both enjoyed their first ever victories in a single; Tim won the masters B/C single sculls category with a time of 11 mins 40 secs and Jaione took top honours in the women’s band two single sculls category with a time of 12 mins 10 secs. The double act of Helen Knowles and Ali Brown, meanwhile, continued their recent run of fine form by topping the women’s masters C/E double sculls category, crossing the line in 11 mins 45 secs. More than 120 crews from as far afield as Nottingham entered the event. They had to complete a 2.6-kilometre course in the quickest time possible in the main head, and a 1.2-kilometre course in the mini head for younger rowers. “It was great to see to so many rowers of all ages enjoying themselves, in what was the first event of the season for most competitors” said event organiser Josh Dexter. “The perfect weather conditions led to some fast times.